Chess-for-Youth Programs: Schools need chess equipment to start a chess program. We have met our goal! Thank you for your support. Playing chess has proven to help students enhance their creativity, improve their power of concentration , develop and expand critical thinking skills, boost memory and retention, and achieve superior academic performance. Additionally , chess has been shown to augment problem-solving capabilities, provide cultural enrichment, advance intellectual maturity, and enhance self-esteem. We know that these are qualities that school administrators, parents, and teachers desire for their students. We want to help. 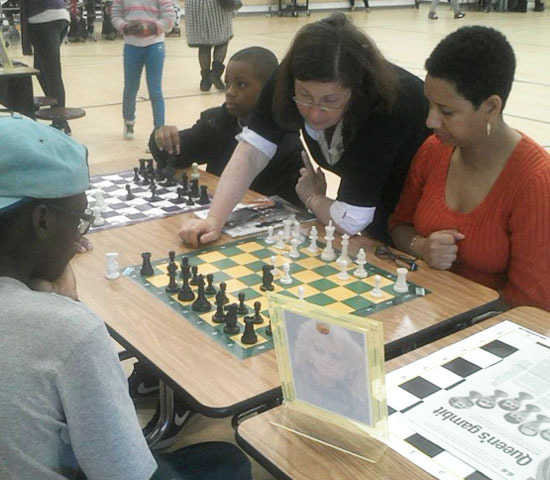 Most schools do not have the budget to start a chess program, you can help change that. List of schools we have helped in the last 12 months. The U.S. Chess Trust provided chess equipment to Ryan Academy High School – a move that helped these new chess players find wisdom in chess play. This is what their teacher, Lisa Suhay, had to say. Each day at a small private school in Norfolk I teach four courses: 12th Grade British Literature; 9th grade composition; journalism and creative writing. The breakthrough tool, however, was the game of chess. I went into the classroom with three boards, a set of descriptions of each piece as a character (knight, king, queen, bishop, pawn/soldier, castle/rook) and a very crazy teaching plan. Students in all my classes would learn to play. No excuses. Results were immediate and dramatic. My discipline problems pretty much evaporated. Students with ADD, ADHD, dyslexia were transformed into chess-a-holics. Those who previously were labeled by themselves and others as least likely to succeed were suddenly winners. Since we had nearly 40 players we formed the school’s first chess club. I applied to the U.S. Chess Trust in Walkill, NY and the Virginia Scholastic Chess Association in Richmond for aid in the form of more chess boards. The U.S. Chess Trust agreed to supply boards so we can keep all the students in play. The U.S. Chess Trust also featured our school on its national website. Then I set them all to the task of writing Chessays (chess essays): “How is chess like life?” Those essays are piled beside me as I write and from them shines a light so bright it brings tears to my eyes. An 18-year-old girl wrote, “Life is not an easy game to play…There is not one smile that is permanent. Love comes and goes. Heartache is a deleterious emotion that can make our ways of thinking very destructive. This is our battle.” It’s chess, but they’re not just playin’ anymore.